Past Life Readings are an opportunity to learn about your various past lives, when and where you lived, how you lived, what talents or characteristics you share from then until now, what challenges you faced that may still affect you and life patterns that keep repeating. Whether you are just curious about your past lives or would like to learn about your karma and clear it, Past Life Readings give you greater insight into yourself and may provide information that’s relevant to your current life. 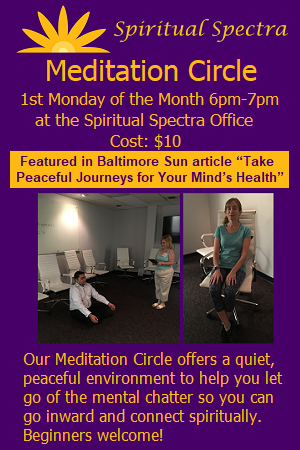 We offer Past Life Readings in our Maryland office. Read further for cost and description. Past Life Readings by Spiritual Spectra are psychic readings done by tapping into a client’s aura and connecting with their Spirit Guides and Guardian Angels to receive information about their various past lives. Information may also be shared by spirits who knew the client in a past life. In some cases, the information will be disseminated by the use of tarot cards; it depends on how much information is being shared and how quickly because tarot cards help to sort the information in a way that may be easier to share with the client. Past Life Readings can sometimes reveal past life experiences that are challenging and overwhelming so we provide an empathetic, non-judgmental, and supportive environment. For karmic issues that may arise, we may make recommendations to clients as to their life choices or ways they can heal their karmic debt. Being centrally located, our Past Life Readings serve the following communities: Columbia, Ellicott City, Clarksville, Elkridge, Catonsville, Jessup, Fort Meade, Laurel, Fulton, Silver Spring, Clarksville, Highland and Olney, Maryland. Contact us to schedule an appointment today!